So the ol’ Sport is showing poor sportsmanship by refusing to make the drum tumble or spin? On these front loaders, like all of ’em, the motor is controlled by its own control board that tells it when to turn on and how fast to run. So, if the drum’s not moving, how do you know whether the problem is the motor or the control board or even something altogether different like the door switch? Well, one method is the process we professional appliantologists call, “dee-ductive reasoning.” Oh yeah, see, in appliance repair school we learned about reasoning and logic an’ stuff ‘cuz we studied all the great philosophizers who wore bed sheets all the time and spoke furrin’ languages like Greek, or something. Anyway, in the dee-ductive method, we use the process of elimination to show what the problem ain’t. Well, if you rack up enough ain’ts, pretty soon you’re left with the ’tis. And one of the ain’ts that’s easy to check is the motor. If the motor checks good, then you know the problem ’tis something else. See? I know, it’s real complicated an’ all but that’s why we professional appliantologists makes the big money! – touch your meter leads to the following pins, should get about 6 ohms for each reading: pins 1 and 2, pins 2 and 3, pins 1 and 3. 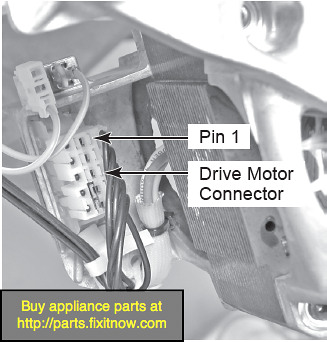 This entry was posted in Washer Repair on July 14, 2010 by Samurai Appliance Repair Man.